For one second, just forget about all of the yards, touchdowns, records and awards Peyton Manning has amassed in the last three seasons – though there have been a lot of them – and recognize his greatest accomplishment: He has allowed Broncos fans to move on from John Elway. Manning isn’t Elway, either. He’s better. In fact, he’s better than everyone, ever. But as easy as he continues to make it look, even Manning couldn’t have predicted the level of success he’s had in Denver. Just three years ago, Manning was a 35-year-old quarterback coming off multiple neck surgeries, with an arm that couldn’t throw the ball 10 yards. The Broncos were quick to throw Tebow into the trash bin that is the New York Jets, but they also drafted Brock Osweiller in the second round of the NFL draft because… well, who really knew if the Manning experiment would work? For 13 years, there weren’t many things you could count on more than watching “The Sheriff” stride out onto the field, bark orders to those around him and outduel his opponent at every turn. It took 227 straight starts before anybody could pull Manning out of the game, and when he did come out, there were no assurances he was going back in. The Broncos may have celebrated the arrival of Manning, and Elway may have told us all that there was no “Plan B,” but don’t be misled, betting on Manning was a gamble. Luckily, it paid off. It’s a new era, and passing has never come easier, but none of that takes away from what Manning did last season. His 5,477 yards and 55 touchdowns were both NFL records, and even when adjusting for the era, he put Elway’s bests to shame. In 16 seasons, Elway never threw more than 4,100 yards or 27 touchdowns. Last year, Manning had 29 touchdowns by Week 8. This year, things aren’t that much different. Manning may not be putting up the same “Star Wars numbers” he did last year, as Jim Irsay might say, but they are astronomical, nonetheless. He now owns the record for most touchdown passes thrown, a mark he reached against San Francisco this season. 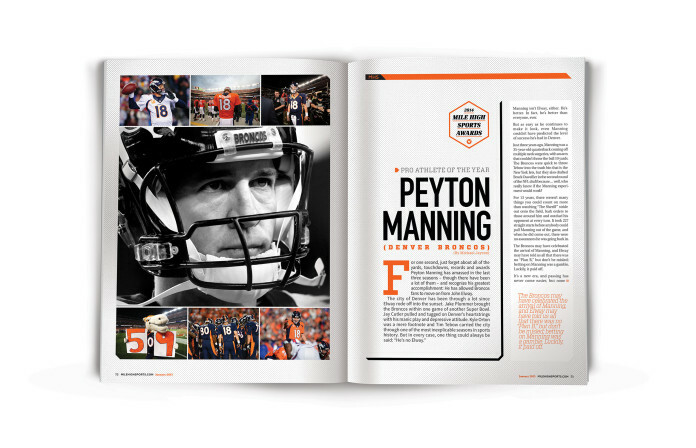 In the grand scope of things, Manning may not be the most-important player in Broncos history. At this point, that designation still belongs to Elway. But there’s no question that Manning is the best quarterback to ever wear a Broncos uniform, and he still has more history to write. At 38 years old, the former No. 1-overall pick has yet to miss a beat. The only thing stronger than his skills is his love for the game. And while they say Father Time has yet to take a loss, Manning is putting up one heck of a fight, and it looks like he is taking this game into overtime. What Manning has done over the last three years in Denver would have been nearly impossible to predict, and Broncos’ fans need to recognize exactly what they are witnessing because they may never see it again. Now, there is just one last thing that needs to be done: Help the Broncos hoist the Lombardi Trophy for a third time. The Broncos have had a lot of talented receivers in their storied history, but none have been as naturally gifted as Demaryius Thomas. Sure, having Peyton Manning as your quarterback helps, but Thomas is a superstar in his own right, and this has been his best season yet. After setting a Super Bowl record for most receptions in February, Thomas began the 2014 campaign slowly, but quickly rebounded with seven-straight 100-yard receiving games, one game shy of Calvin Johnson’s record. Thomas also joined Marvin Harrison and Jerry Rice as the only players in NFL history to post 1,400 receiving yards and 10 touchdowns in three consecutive seasons. When Nathan MacKinnon was drafted first overall by the Colorado Avalanche, it wasn’t a no-brainer by any means. By all accounts, Seth Jones was supposed to be the easy choice. Not only was he the top-rated prospect by most experts, but his father, Ronald “Popeye” Jones, played for the Denver Nuggets. It seemed like the perfect fit; but following one season with MacKinnon, Avalanche fans are more than happy with the decision. 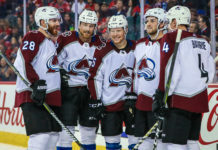 After lighting the NHL on fire in his first playoff series – and drawing comparisons to nearly every hockey great – MacKinnon ran away with the Calder Memorial Trophy as the league’s Rookie of the Year. And if things go right, that should only be the first of many trophies to sit on his mantelpiece. It is hard not to love Kenneth Faried. He’s got the hair, the smile and the ferocious style of play that every fan loves. But if you ask him, he’s more than just an energy player. And after what we’ve seen in the last year, he may be right. Faried finished last season averaging 19.8 points and 10.8 rebounds in the Nuggets final 25 games, but that’s not nearly as impressive as what the Manimal did once the season ended. When he was called to workout with Team USA before the FIBA World Cup, nobody expected him to make the team. But that’s exactly what he did, winning a gold medal in the process. Additionally, Faried was named to the FIBA All-Tournament team. If you think Peyton Manning is Denver’s only aging Hall-of-Famer, think again. 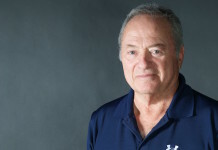 When the Outlaws traded for John Grant, Jr. in September 2013, he, like Manning, was already in his late-30s and on the hunt for another championship. Grant came to Denver with four MLL titles already under his belt – three of which came at the expense of the Outlaws – but was still looking to pad his legacy. And after leading the team in both points and assists, as well as breaking MLL’s all-time goals record, Grant brought the Outlaws their first championship in five attempts. Unsurprisingly, his three-goal performance was enough to earn him the game’s MVP award.